The Cabinet Manual: A Guide to Laws, Conventions, and Rules on the Operation of Government has proven its worth, both within Whitehall and amongst the wider British public. On 9 June, once the results of the general election had become clear, the Cabinet Manual prevented any confusion over the fact that the incumbent prime minister remains in office and has the right to test the confidence of a hung parliament, especially where the party still holds the plurality of seats. 2.12 Where an election does not result in an overall majority for a single party, the incumbent government remains in office unless and until the Prime Minister tenders his or her resignation and the Government’s resignation to the Sovereign. An incumbent government is entitled to wait until the new Parliament has met to see if it can command the confidence of the House of Commons, but is expected to resign if it becomes clear that it is unlikely to be able to command that confidence and there is a clear alternative. Gus O’Donnell, the former Cabinet Secretary who spearheaded the Cabinet Manual in 2009-2011, appeared on Channel Four’s coverage of Prime Minister May’s trip to the Palace, where she informed the Queen that she could continue in government and would like to test the confidence of the new parliament, and her subsequent speech outside Downing Street on 9 June. 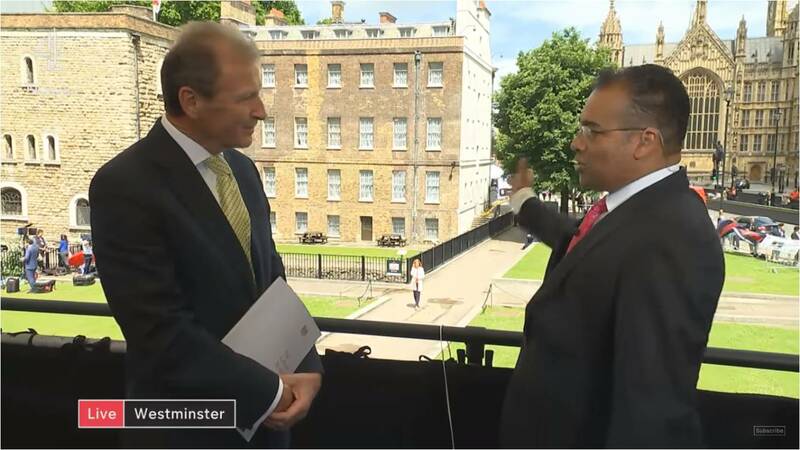 At 18:55, Channel Four presenter Krishnan Guru-Murthy introduces Gus O’Donnell, who can be seen holding a copy of the Cabinet Manual. Guru-Murthy: What will be going on in the Civil Service now as they try to make sense of this? O’Donnell: They’ll have done preparations for all possible outcomes. This is a minority government; it’s one of the ones that they would have worked through. It’s a difficult scenario — no question about that. Coalition is much stronger, more stable, to be honest; it’s more formal. The problem with minority government is that it’s an issue-by-issue deal, and the kinds of deals that get done by minority governments tend to be in smoke-filled rooms in Parliament over there rather than in cabinet committee rooms in Number 10. So, it’s more complex, and it’s more difficult for the Civil Service. Guru-Murthy: You’ve got the Cabinet Manual. What would you be looking up? O’Donnell: She [May] will say, “This is what I’m gonna try to do. I will put a speech for you to make to Parliament,” and it’s going to have possibly not as much in it as previously thought because she’s got to get the legislation down to the bare essentials. In a minority government, you want as few votes as possible in parliament. Guru-Murthy: So the manifesto [the Conservative and Unionist Party’s election platform] is out the window. O’Donnell: Well, it’s got to be taken down to the bare essentials. We’ve got to do Brexit, which requires an enormous amount of legislation. All those things which were nice to have in the manifesto might well disappear. Gus O’Donnell omitted a key point about how the Fixed-Term Parliaments Act has altered the confidence convention in the Westminster Parliament and complicated matters by replacing it with something alike to European-style constructive non-confidence. The Fixed-Term Parliaments Act, 2011 replaced the standard confidence convention — which still exists here in Canada and in our sister Realms of Australia and New Zealand — with a Continental European-style constructive non-confidence. In Canada and in the United Kingdom pre-2011, votes on confidence include votes on the Address in Reply to the Speech from the Throne (or Queen’s Speech, as the British call it), on supply bills, and on matters which the government deems a matter of confidence, which would usually be linked to a key policy bill derived from their campaign platform (or manifesto, as the British call it). The Ministry thereby possess some latitude and flexibility on questions of confidence, but the votes on the Address in Reply and supply are, as practical matters, almost automatically and necessarily votes of confidence. So if the Ministry loses such a vote, then the Prime Minister would either have to resign or advise an early dissolution, depending on the circumstances and whether an alternative government could be formed from within the same parliament. But this is not the case under constructive non-confidence and confirmation voting. Under this system, first pioneered in Continental European parliamentary democracies, the Ministry has no discretion whatever in deeming any vote a question of confidence. The assembly alone determines the votes which hold the authority to withdraw confidence in the Ministry, and in some jurisdictions, the assembly must also specify a potential alternative government in the same motion. Confirmation voting refers to the practice whereby the elected assembly votes directly on which individual should become prime minister; the Sovereign, President, or Speaker (depending on the country) would then be bound to appoint this person as prime minister. The Fixed-Term Parliaments Act draws upon these two Continental European methods in determining how the House of Commons can withdraw its confidence from Her Majesty’s Government and replace it with a new set of ministers. The Fixed-Term Parliaments Act allows only one possible method by which the Commons can withdraw its confidence from the Ministry: on a motion, which would have to pass by simple majority, “That this House has confidence in Her Majesty’s Government.” In other words, if the Commons in this hung parliament votes against the May government’s Queen Speech in a few weeks, this does not mean that the Commons has automatically withdrawn its confidence from the Conservative minority government. Instead, the Commons would then have to support, by simple majority, the aforesaid motion in a separate vote. There is no longer such things as automatic loss of confidence. If the Commons passes the motion “That this House has no confidence in Her Majesty’s Government,” then the Fixed-Term Parliaments Act gives MPs fourteen days in which to propose an alternative government and approve it through a motion worded “That this House has confidence in Her Majesty’s Government.” If the Commons fails to do so within 14 days, the Parliament will automatically dissolve in order to break the deadlock. This procedure essentially breaks the German-style constructive non-confidence into two steps. It sounds reasonable in principle, but it has never been tested in practice. The text of the Fixed-Term Parliaments Act and the procedure which it lays out suggests that the incumbent prime minister would first have to tender her resignation to the Queen and that the Queen would then have to appoint a new Ministry based on whatever agreements the relevant political parties can form. And only after the Queen appoints the new ministry would the Commons be able to hold the second vote on the motion “That his House has confidence in Her Majesty’s Government.” Logically, this is the only possible procedure for a mid-parliamentary change of government, because the Commons could not vote on the motion “That his House has confidence in Her Majesty’s Government” with reference to the potential alternative Ministry before it takes office! That simply would not make any sense. Therefore, the procedure under the Fixed-Term Parliaments Act does not amount to a confirmation vote in the same way as the German method, because the order of events (parliamentary vote and appointment of a new Ministry) is reversed. Where the President of Germany appoints the Chancellor of Germany in accordance with the confirmation vote of the Bundestag (as part Article 63 of the Basic Law), the incumbent prime minister would have to resign after losing the vote of confidence, the Queen would then have to appoint a new prime minister and ministry, and the House of Commons would, in turn, effectively ratify the new ministry through the motion “That this House has confidence in Her Majesty’s Government.” But if the Commons still refused to support this new Ministry, then the Parliament would be dissolved after fourteen days of the Commons having withdrawn its confidence in the first Ministry, and this new Ministry would then become a caretaker during the subsequent general election. The Cabinet Manual outlines some of these scenarios very briefly, but it does not specify precisely how the order of events would take place. In fairness, this was probably intentional; the Cabinet Office did not design the Cabinet Manual as an exhaustive list of every possible permutation of events — which would, at any rate, have been impossible. 2.18 Where a Prime Minister chooses to resign from his or her individual position at a time when his or her administration has an overall majority in the House of Commons, it is for the party or parties in government to identify who can be chosen as the successor. 2.19 Under the Fixed-term Parliaments Act 2011, if a government is defeated on a motion that ‘this House has no confidence in Her Majesty’s Government’, there in then a 14-day period during which an alternative government can be formed from the House of Commons as presently constituted, or the incumbent government can seek to regain the confidence of the House. If no government can secure the confidence of the House of Commons during that period, through the approval of a motion that ‘this House has confidence in Her Majesty’s Government’, a general election will take place. Other decisions of the House of Commons which have previously been regarded as expressing ‘no confidence’ in the government no longer enable or require the Prime Minister to hold a general election. The Prime Minister is expected to resign where it is clear that he or she does not have the confidence of the House of Commons and that an alternative government does have the confidence. I underlined the sentence where the Cabinet Manual acknowledges the fact that the votes on the Address in Reply and on supply no longer amount to automatic votes of confidence, because the Commons can now only withdraw its confidence from the Ministry under the Fixed-Term Parliaments Act. But the concluding sentence is not as clear as it could be, even within the context of how the Cabinet Manual should function as a guide without prescribing solutions. I would argue that the only situation “where it is clear that [the Prime Minister] does not have the confidence of the House of Commons” occurs after the Commons has passed the motion “That this House has no confidence in Her Majesty’s Government”, and where it would not be possible to regain the confidence of the Commons. But Gus O’Donnell and Krishnan Guru-Murthy were not discussing the upcoming parliament in these terms at around 21:30 in the above video. Guru-Murthy: So this will be a government that could be paralysed a lot of the time, unable to really get legislation through. Guru-Murthy: But what it means is that there’ll be a lot fewer votes because every vote could be a no-confidence vote. O’Donnell: When I was there in John Major’s day, I remember winning by one vote and people [MPs] being brought in [to the House of Commons] on stretchers. I mean, that’s potentially — the world of the House will come back. Guru-Murthy’s statement is incorrect. It is not the case that every vote would be a no-confidence vote! That’s not what the Fixed-Term Parliaments Act says. In fact, that is the exact opposite of what it says. The Fixed-Term Parliaments Act also raises an interesting paradox about how a Ministry holds the confidence of the Commons. It specifies the one condition upon which a Ministry can lose the confidence of Commons, and it spells out the means by which a new Ministry gains the confidence of the Commons. But it is silent on whether or how an incumbent government commands, loses, or gains the confidence of the Commons. The absence of non-confidence now signifies confidence. It’s very bizarre. And it’s the exact opposite of how things work in Canada, Australia, New Zealand, and how they worked in the United Kingdom pre-Fixed-Term Parliaments Act, where the elected assembly confirms or denies its confidence in the Ministry by accepting or rejecting the Address in Reply and supply. This paradox applied in the last parliament, elected in 2015. David Cameron’s Conservatives and Nick Clegg’s Liberal-Democrats formed a coalition government in 2010, before the Fixed-Term Parliaments Act entered into force. But after David Cameron led the Conservative and Unionist Party to an unexpected victory and majority of seats in the 2015, his tenure as Prime Minister did not depend in any way upon the House of Commons in the 56th Parliament passing the motion “That this House has confidence in Her Majesty’s Government.” And since votes on the Address in Reply to the Queen’s Speech and supply bills no longer constitute votes of confidence, the Cameron government never gained the confidence of the Commons through those old means either, as British governments did pre-2011. Theresa May now faces the same situation. Under May’s incompetent leadership and disastrous campaign — the worst since Ted Heath’s “Who Governs?” campaign of 1974 — the Conservatives lost their majority and now only command a plurality of seats. But even if May’s minority government loses the vote on the Address in Reply to the Queen’s Speech, it will not thereby lose the confidence of the Commons. Instead, the Commons would then have to take action and pass a motion of non-confidence under the Fixed-Term Parliaments Act. So the May government will command the confidence of the Commons unless and until the Commons expressly withdraws its confidence, even if the Ministry loses crucial votes that used to be questions of confidence pre-2011. Many British observers have speculated that the upcoming 57th Parliament of the United Kingdom will not last for the full five years that the Fixed-Term Parliaments Act prescribes, that it will not live to see 2022. The Conservative and Unionist Party of Great Britain holds 318 seats, and the Democratic Unionist Party of Northern Ireland holds 10. These formations combined hold 328 seats, and a majority in this parliament will be 322 seats, since Sinn Fein’s 7 MPs-elect will not take their seats. Unlike here in Canada, where our smaller Commons combined with rigid and pathological party discipline make even the slimmest majority feasible, such as in the 36th Parliament (1997-2000), where Chretien’s Liberals held a majority of 4, a majority of 6 in the Westminster Parliament is negligible and has traditionally been regarded as being practically untenable. But the Fixed-Term Parliaments Act could, in theory, save the Conservative-DUP alliance because it only allows the Commons to withdraw its confidence from the Ministry through the aforesaid procedure. However, the Fixed-Term Parliaments Act will not save May’s premiership. I suspect that the Conservative parliamentary party will oust her as leader by the end of this calendar year because her leadership has become untenable. Theresa May took a huge risk by going through the trouble of securing an early dissolution under the Fixed-Term Parliaments Act, which required Labour’s support; therefore, she needed to win big in order to have made that risk worthwhile. She didn’t. She is no further ahead than she was before and has, in fact, lost some ground. A stalemate is a not a victory for the army initiating a siege. May has become the personification of the “coalition of chaos” that she rallied against. Not since Ted Heath in 1974 have we seen such incompetence. The Conservative and Unionist Party pledged in its manifesto a few weeks ago to “repeal the Fixed-Term Parliaments Act.” At this stage, the Labour Party might even be willing to support such a repeal bill! And if the Westminster Parliament repeals the Fixed-Term Parliaments Act, the Crown of the United Kingdom’s prerogative over dissolution will come out of abeyance and be restored to the status quo ante 2011, under the Parliament Act, and the old confidence convention will also reassert itself, too. This entry was posted in Confidence Convention, Constructive Non-Confidence, Fixed-Date Elections. Bookmark the permalink. Is there any such Cabinet Manual that would have similar ‘instructions’ for the British Columbia Legislature? What would happen in the (admittedly unlikely) situation where a government cannot pass a budget but no one can force a vote of no confidence? I don’t know. The British would risk running aground after venturing out into those uncharted waters. Further to that, is there any constitutional convention or statute along the lines of s. 54 of the Constitution Act 1867 requiring that only the May government’s proposed budget could be considered by the Commons? Or could Labour propose a budget in contravention to the Conservative budget and try to cobble together a majority for it? Yes, both the principle and the practice of Royal Recommendation are the same in the United Kingdom. Pursuant to Standing Order 48 of the British House of Commons, only Ministers of the Crown can introduce budget bills. But these are no longer questions of confidence because of the stupid Fixed-Term Parliaments Act!